Giveaway: Spring Fling! | Finding delight. Hello friends! I’d like to start hosting more GIVEAWAYS on the blog. Are you game? This kick-off giveaway celebrates the fact that Spring is right around the corner and includes items I think you’ll love. Honestly, sending fun mail-time surprises is second only to receiving fun mail-time surprises in my book. So, let the giveaways commence! This giveaway is open to international participants but you must be 18 years or older to participate. 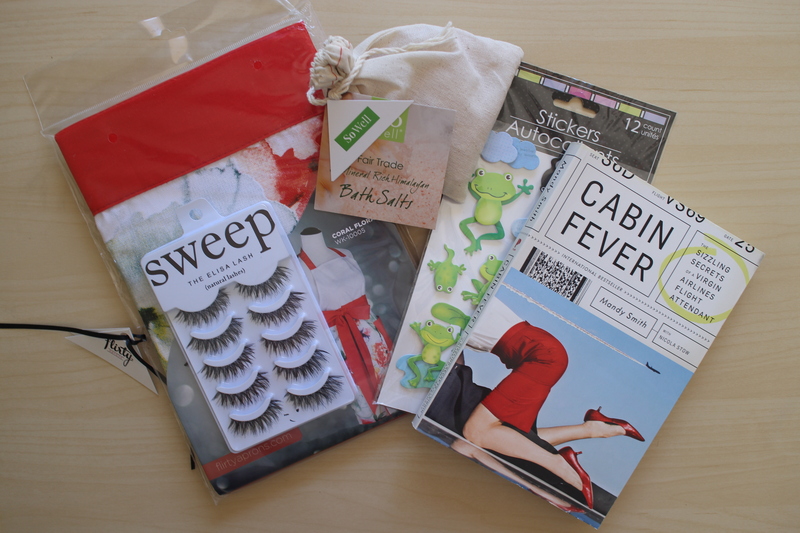 Cabin Fever: The Sizzling Secrets of a Virgin Airlines Flight Attendant by Mandy Smith … for some in-flight reading material. Frog stickers … for decorating pocket letters, planners, or happy mail (spring-themed, of course!). Sweep lashes … to glam up your look for a night on the town. + a hand-written letter from me! You must follow Finding Delight in some capacity — either via WordPress, Bloglovin, or Facebook. Leave a comment down below sharing a. what you’re looking forward to this Spring, and b. what content you’d love to see more of on Finding Delight!! Make sure to include a way to contact you (link to your blog, email address, Twitter/IG handle) in the event you’re the winner. The giveaway will remain open from time of publication until noon (est) on Mar 26, 2018, at which point I’ll randomly select a winner. a. I am looking forward to running and reading in the sunshine! Not at the same time of course! b. more planning and book posts! Aw! I love giveaways! I’m definitely looking forward to being outdoors more…maybe a picnic or two with the hubs. I would have to say I would love to hear more about books. The one in the giveaway looks intriguing and I’m looking to build my summer reading list! Oh…and kari@karilife.com or http://www.lifekaristyle.com is how I can be reached. Fingers crossed! a. This Spring, I’m definitely looking forward to passing my financial advising tests!! EEK, crossing my fingers. The tests are hard! b. I’d love to see more of your intellectual posts 🙂 We don’t find lots of blogs related to intellect! This is really nice of you and the apron looks cute! I look forward to spring if only for the nicer weather and spending more time outside in the nature. Good luck to everyone who enters! I’m definitely looking forward to being outdoors more…:-) Nice giveaway! Giveaways are a fun way to engage your readers, and I really like the personal touch of a letter written by you. This Spring I’m most looking forward to…. Spring itself!! That’s a great giveaway, everything look so cool! I am so looking for warmer days this Spring and no more rain if it possible! I love your book reviews so I would love to see some classic books reviewed by you! Pingback: mid-week round-up | Finding delight. Hi there! Finding Delight is a lifestyle and lifelong learning blog written and curated by me in Alabama. Along the way, I attempt to tackle the rough real world with books, budget-livin', brainpower and all the beautiful stuff you can find when you really look. Won't you join me? The true delight is in the finding out. Links on this page may contain affiliates. Thanks for supporting the brands that support Finding Delight!